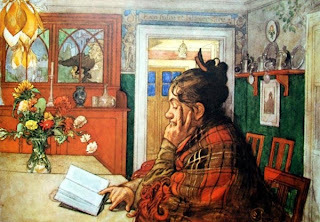 The Swedish artist Carl Larsson was born in Stockholm, on May 28, 1853. His family was poor and his parents split at an early age. He lived with his father and brother in slum housing in Stockholm’s East End. In 1866 at the age of thirteen his teacher urged him to apply to the Stockholm Academy of Fine Arts where he was accepted to the preparatory school there. After three years at the age of sixteen Larsson was promoted to the Antique School of the academy. He was promoted again to the Model School and then the Painting School of the Academy. It was at this time he began working as an illustrator for the publication Kasper. In 1874 Larsson won a medal for his painting Moses Abandoned by His Mother. In this same year he was also promoted at Kasper. The next two years Larsson was awarded two more medals for his paintings. In 1877 he traveled to France staying in Paris and spent time in Barbizon and Grez-Sur-Loing.He began painting in the barbizon style and was influenced by Bastien Lepage. 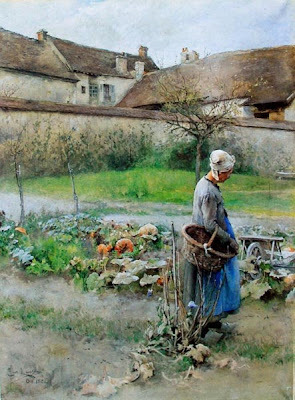 One of his watercolors from Grez was awarded a third class medal at the Paris Salon of 1883. 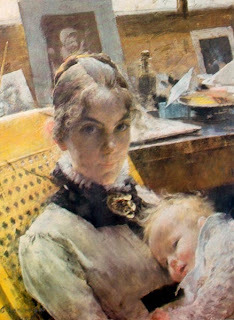 In 1883 Larsson also married Karin Bergöö another artist, they had eight children together. Larsson’s family life became the focus of his most famous work. Larsson wrote and illustrated many books on his new life as husband and father. The joyous scenes he painted of his home and family catapulted him to fame throughout the world and the decorations and furniture Karin created for the interiors launched a new style of interior design. He continued his illustration career and also began painting murals. In 1909 a book of Larsson’s watercolors was published in Germany. It was titled The House in the Sun and sold 40,000 copies in three months. Throughout his career Larsson continued exhibiting his paintings and won many awards. He also completed several large murals and frescoes. His last mural Midwinter Sacrifice was painted for the National Museum and rejected by the museum committee. The mural was finally repurchased by the museum from a private collector in 1997 and hung in its intended space. 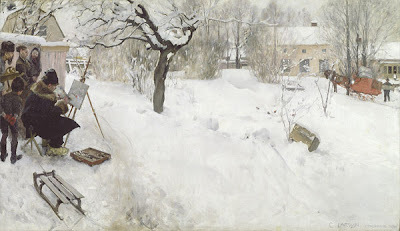 Carl Larsson died in 1919. Good post! 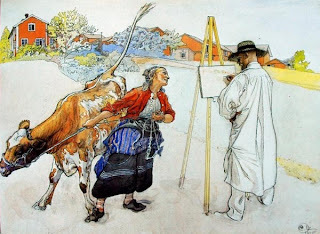 I like Carl Larrson, his work has character. It does, and it also has so much obvious joy to the scenes. Amazing when you think of how difficult and tragic his early childhood was and that he suffered bouts of suicidal depression throughout the rest of his life. He really is an inpsiration. He was a great artist! There's going to be a Carl Larsson exhibition held in Turku, Finland next year. Its main focus is in his work created in Grèz-sur-Loing and Barbizon, and his hometown Sundborn in Sweden. I visited his home in Sundborn a few years ago, what a wonderful treat.Many of his paintings and his wife's original and copied linens adorn the house.Incredible house and studio, the subject of many paintings still all there. And a little ways off, a museum that has portraits of the townsfolk that Larsson did as a way of saying thanks to his neighbors…all well worth the visit!